Add a touch of the west coast to your garden with the Home Bazaar Pacific Grove Bird House. This home has all the charm of a seaside cottage for the pleasure of your birds. A yellow door and soft yellow accents around the faux windows and entrance hole contrast the light blue color of the home, for a stylish look. Natural wood shingles atop the wooden house add realism, and a porch complete with railing brings surprising detail to the piece. The 1.25" diameter entrance hole offers passage to wrens, chickadees, and woodpeckers, while excluding larger birds. A ladder on the interior of the home offers fledglings a way to reach the exit, and two drainage holes help excess water escape the nest. A large cleanout panel on the back of the item opens it readily for simple nest checks and cleanouts. 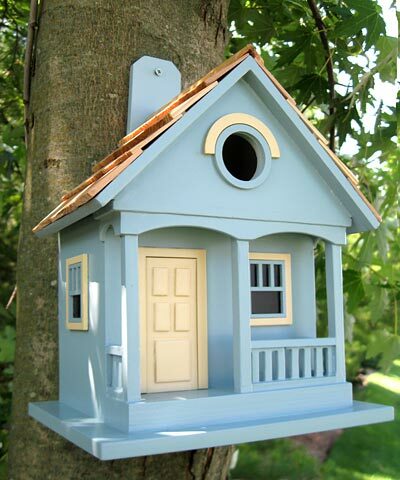 Use the hanging tab to mount this home to a post or tree, for the delight of your birds. The wooden construction will last for several seasons, and remain a charming house in your garden. Bring a delightful look to your bird sanctuary with this Pacific Grove Bird House.